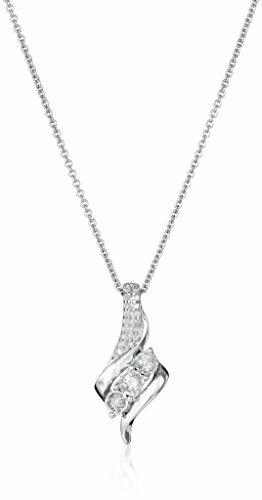 Swirling sterling silver creates this elegant pendant necklace design. The center of the pendant showcases a three larger round diamond stones surrounded by miracle plating that emphasizes the stones' size. Sterling silver creates this elegant necklace design, whose pendant showcases three larger round diamonds surrounded by miracle plating, which emphasizes the stones' size. Sterling Silver Oval Saint Christopher Medal Necklace with Rhodium Plated Stainless Steel Chain, 20"